Classy. That extremely blurred shadow in the top right is B'Elanna, in case anyone is wondering. Is there anything significant about it? I mean, except that it's somewhat ugly. 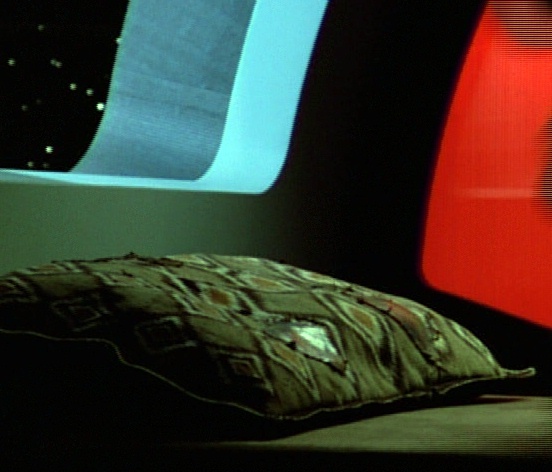 It looks awfully familiar, no? So nice they used it twice! At first I thought they were an exact match, but having taken screenshots...well, the patterns are quite similar but the colours aren't. 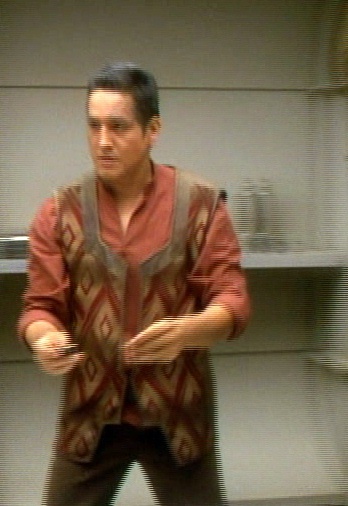 My only conclusion is that Chakotay purposely modelled this horrific waistcoat after his pillowcase. Maybe he just likes that fresh, modern, diamond-patterned look. Not that I have anything against diamond-patterned clothing. After all, Pringle is from my home country and my grandads wore Pringle diamond-patterned golf jumpers for as long as I can remember. That said, when I was born both grandads were in their sixties. Hm.